Colonew is a unique blend of all-natural ingredients, formulated to be gentle on your body while eliminating toxic buildup in your colon. 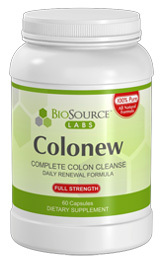 Unlike other harsh colon cleansers, you can use this product daily to maintain a healthy colon. Recommended Usage: Our research has found it most effective to begin taking Colonew at least 7 to 10 days before starting the Complex Diet Drops protocol. It can be used daily during, and after the diet to help enhance your results. Use this product for at least one month, every 3 months to maintain a healthy gut.